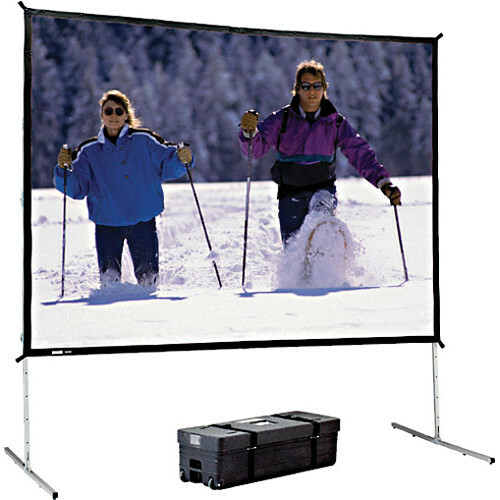 The Dalite 56 x 96" Heavy Duty Fast-Fold Deluxe Projection Screen is the way to go when you need a free standing portable screen that easily sets up and knocks down. Make no mistake, Fast-Fold Screens are designed with heavy use in mind. The rugged aluminum tube legs use easy release latches to set up (without tools). The screen material is backed by a black opaque material that produces a clean, crisp and bright image. A lightweight, yet exceptionally stable, folding aluminum frame fits into a case for convenient transport and storage. The frame folds without coming apart while "speedy cranks" allow "set up" and "tear down" without tools. Box Dimensions (LxWxH) 44.0 x 18.0 x 13.0"